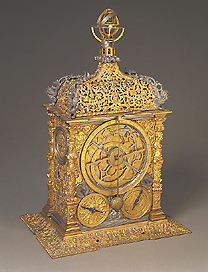 This truly magnificent clock is unsigned, but is certainly of German manufacture and was probably made in the 1570s. The brass case is gilded and richly decorated. Each face bears one or more circles of different diameters. The largest circle has a mechanical astrolabe, with an external horary circle. The rete can rotate in a sidereal day, and bears pointers for the sun and moon, with a dragon as the pointer for the nodes of the moon. The circles on the two side faces serve to make the chimes function. The gilded brass cupola is pierced and surmounted by a small armillary sphere.